AFTER: In F for Fake Orson Welles mentions how he started on top (with The War of the Worlds and Citizen Kane) and is ending on the bottom. Sadly, I totally agree with that statement. 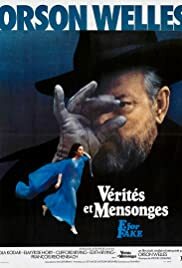 F for Fake is classified as a documentary and Welles states in the beginning that for the next hour, all you will see and hear is based on fact. While there is a sort of documentary style to the film, there is also a strong sense of a fictional narrative connecting everything together. Welles has obviously made this choice deliberately and I can see where he is trying to go with the style, but it just doesn’t work. I tried, I really did. But I could not get past the conflicting message of truth and lies that Welles tries to clarify. Going along with the style is the editing. There is a lot of experimentation with the Kuleshov effect which is a fundamental theory in film editing. A lot of F for Fake focuses on people staring at each other and at other things going on around them. It’s interesting the first few times because it got me thinking about the Kuleshov effect for the first time since History of Film last year, but when it is constantly repeated, it becomes tedious to watch. I must say I did enjoy the magic tricks Welles performed at the beginning and end. Some great sleight of hand and misdirection made for a wonderful performance. But a few tricks are not enough to make up for the rest of the film. There were many times I was struggling to stay awake and as a result, I cannot in my right mind recommend this film.